Last week, for the first week of Advent, we looked at the innkeeper. This week we're going to tackle the bad guy of the Christmas story, King Herod. King Herod was, well, king, and apparently he wasn't too keen on the idea of the "newborn king of the Jews" (Matthew 2:2) the wise men came asking about, especially when they told him, "We saw his star as it rose, and we have come to worship him." Does that sound like anyone else to you? Jesus threatened the status quo for Herod with His birth and then again for the religious leaders with His ministry as an adult. The Pharisees were so threatened by Him, His authority and His popularity with the people that they arranged the crucifixion to get rid of Him! They liked their positions of honour and authority. They didn't want to share that with anyone or, even worse, lose it entirely. Never mind that they were putting themselves in direct opposition to the plan of God. That didn't concern Herod or the Pharisees because they were so focused on themselves they they couldn't recognize God working in their midst. Even with prophecies from hundreds of years past, they either couldn't see what was going on around them or they didn't care. 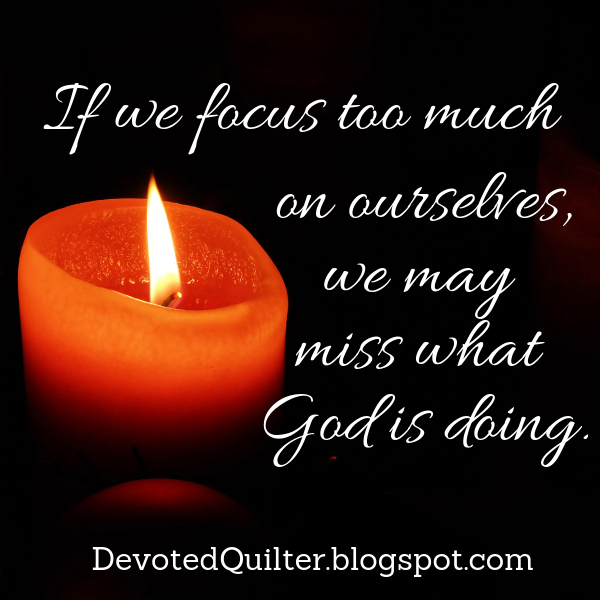 Unfortunately, we can sometimes be so focused on ourselves that we miss what God is doing around us. Or we may see it, but we resist it because it threatens our status quo in some way. As God's people, we shouldn't be the ones getting in the way of His work. We shouldn't be the 'bad guys' of His story, but sometimes we are. We allow our insecurities, our self-interest and our desire to stay comfortable to get in the way of partnering with God in His work. Really, we want to try to be more like the innkeeper and less like Herod.